The client approached the team and requested to integrate the following new components: Best Dressed Competition, Meet My Consultant, My Suit Travels, Blog and a Forum into the current web site. The client had an abstract idea of the project scope but was unclear about how the new components would work and how they would integrate with their current CMS and database. What are we really building? The integration initially seemed minor, until there were several discoveries. Questions emerged during the conversations with the client, such as who are the real users of the components, what are the users’ access privileges and their interactions on the front-end and/or backend. On the technical end concerns were expressed regarding the CMS and database integration with the new proposed modules. Visualizing with the client initial idea on the "Competition Module." Who can submit images and how many? What for files can be submitted (minimum dimension and resolutions)? What other information is captured and/or requested during the submission? Will the store client information be auto-filled? What are the privacy guidelines? Does the voter have to set-up an account? Shall there be a Facebook Login? What for information needs to be captured for potential turning voters into customers? Does admin need to approve image submissions? Can they delete submissions? What will be the reasons for it? What are the competition guidelines (legal)? Can they be edited via CMS or are they hardcoded? Who will manage the competition (self-managed, managed via timer), or is this done manually? What is the current platform for the web site and its content management system? Is the clients’ information stored in the same database as the web site data or is another database system implemented? After gathering all of the information and starting to define the functions, brainstorming with the development team began on how to implement these features and which development platform to choose. There were several challenges such as the current site’s CMS, which was built in .NET. It eliminated the options to build the new modules in a modular and scalable platform such as Joomla or Drupal. Another consideration was that CSS3.0 was not yet compatible with IE 8.0 (late 2010) and would require all animations to be built in Flash/Actionscript that were incompatible with iPads. Different solutions were discussed with the client and development on how to resolve these problems. Since the discussion of an entire site overhaul got started and after reviewing the various options the client selected custom PHP which can later be integrated into Drupal (Drupal modules with minor modifications). Clear about the technological approach, a functional application document was created outlining the users, accesses, and functions and workflow per module. MSNY has an established web site look and feel, and the modules needed to slip in as they were conceived at the same time as the rest of the web site. The junior IA/UI requested the style and design guidelines from MSNY marketing company. But since they were never submitted the team performed an independent analysis of the current web site style and functions. The style analysis included user considerations for age, income, self-perception (trendy, conservative, etc. ), and motivation why to shop at MSNY. There were requests to gain a deeper insight on current site performance via Google Analytics and their social media reach to the marketing company. However, the information was not provided. 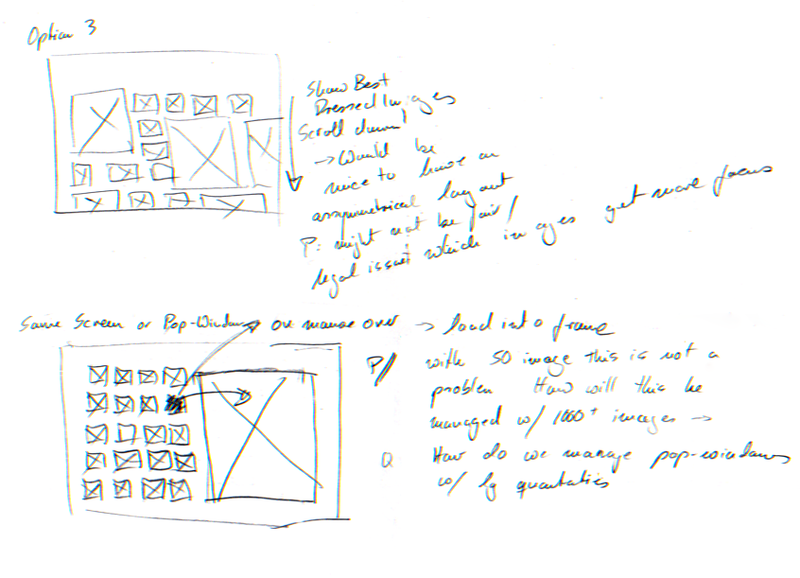 With the help of the junior designer, a rough wireframe was created to outline the functions. In the meantime different interaction concepts were explored and reviewed to add a few bells and whistles to the site and move from a static to a more interactive user experience. The new sitemap needed to integrate seamlessly the current web site and the new modules into one unified experience. Workflows were designed to help client and development to conceptualize the functions and error messages. The rough wires were flushed out in details outlining each interaction. The client was able to review them and make changes if needed. However, the wires were successfully accepted without any changes. The development was deployed and the site was approved without any changes in functions and user interactions.